Did you know that most hospitals begin the hiring process for May grads in January? With that in mind, it’s time to get your resume tuned up, iron your professional attire and begin the job hunt. To help you get a jumpstart, we’re launching a Facebook Live series that focuses on the job hunt for student nurses. This must-attend series will be co-hosted by HR representatives and talent acquisition professionals looking to hire soon-to-graduate nursing students just like you. Accepting the Right Job for You – Date coming soon! What else can you expect with our Facebook Live series? One of the best parts of going live is that you can ask the questions that you want the answer to. Think about it, you will have the opportunity to ask individuals, similar to those that will be hiring new nurses like you, questions on your mind about the job hunt, standing out to potential employers and securing a position. Another fun perk? We will be sharing helpful resources with attendees. Anything from sample resumes and cover letters to tips about a new tactic many hospitals are using, video interviews. For each event, we will share a link for you to let us know you’re coming, leave questions that you would like to know the answer to, and share with your nursing school friends. 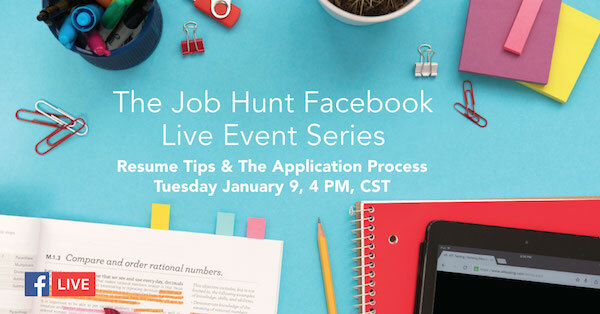 First up, Resume Tips & The Application Process. Mark your calendar for Tuesday, January 9, 4 PM CST.